The Frost-Frosted Cake is a cake made by the Shiverians of the Snow Kingdom in Super Mario Odyssey. The cake is very popular at weddings by tradition as told in the Snow Kingdom's brochure. It is the kingdom's first-place prize for the Bound Bowl Grand Prix. Only the Shiverian Elder can make the Frost-Frosted Cake. During the events of the game, the cake is stolen by Bowser and the Broodals as a wedding cake for Princess Peach's forced marriage to the Koopa king. 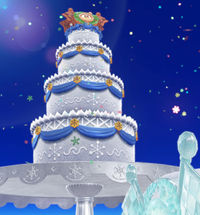 After Mario defeats Bowser in the Moon Kingdom, the Frost-Frosted Cake is the only wedding item that does not return to its original location. This page was last edited on March 30, 2019, at 21:45.